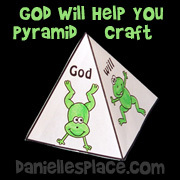 The following crafts and activities come from the Bible lesson "You Can Do Important Things" and from The Resource Room. Through this lessons children learn that even though they are young, they are still important to God. God loves them very much, and he can use them to do great things. This lesson is available on The Resource Room a subscription site. 1. 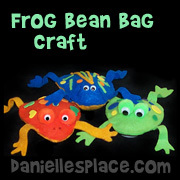 Children cut out the pattern, glue Chenille stems in the inside of the basket to make a handle, color the pictures. 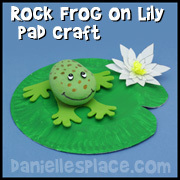 Patterns for this craft are available to members on The Resource Room and as an instant download. 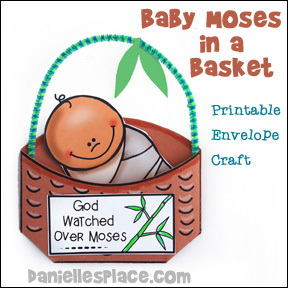 They come in two different styles, one with Baby Moses's hand hanging over the basket (harder to cut out) and one with the Baby Moses wrapped in linens (Easier to cut out). 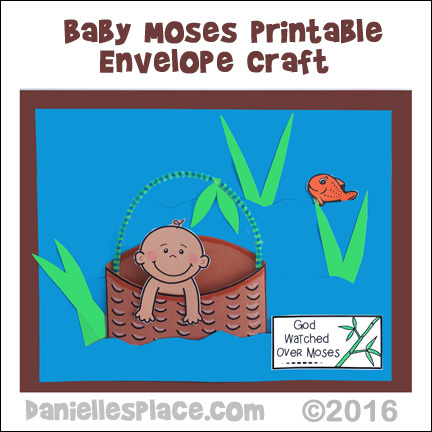 Instant Download Pattern - - Patterns include two different Baby Moses patterns, fish patterns, and note paper. 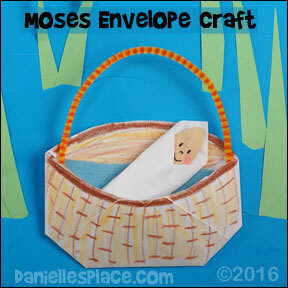 You can also have your children make a display for the Baby Moses in the basket craft. Fold a piece of blue paper in half and cut wavy lines from the center out about two inches apart. Unfold and glue the paper around the edges to another sheet of paper. Children will be able to slip the basket inside the cut lines to make it look like it is in water. They can also place strips of green paper cut to look like reeds in the slits. Fish patterns and the "God Watched Over Moses" card can be glued on the display. 6. Have your children draw faces on the craft spoon or clothespin to make the baby and then roll tissue or other material around the baby for a blanket and then place it in the basket. 7. 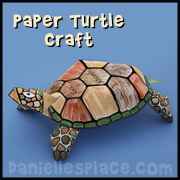 You can also make a display for the craft. Fold a piece of blue paper in half and cut wavy lines from the center out about two inches apart. Unfold and glue the paper around the edges to another sheet of paper. Children will be able to slip the basket inside the cut lines to make it look like it is in water. They can also place strips of green paper cut to look like reeds in the slits. You can also cut fish shapes or use fish stickers to place in the "water". 8. 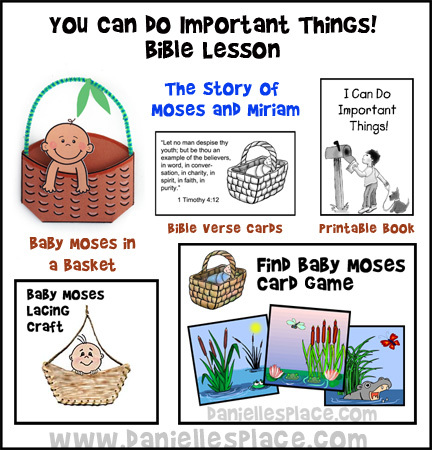 Have children reenact the story of Moses, and talk about how Miriam watched over him from a distance. 1. Cut a paper plate in half but not straight across. Make a slight curve in the plate so that one side is concave and the other convex. Cut a sun shade or cover from another paper plate so that you have a back and front piece. 2. Glue the tops on the basket pieces and then glue the sides together to form the basket. 3. Cut a slit in the center of another paper plate so that the basket fits inside the slit. 4. 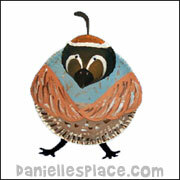 Paint the basket and bottom paper plate and glue them together. 6. To finish cut long strips of green paper into reed shapes and glue them to the paper plate. Punch holes all around the sides of the basket. Have your children lace string through they holes so that they lace two baskets together. 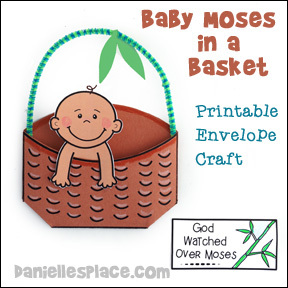 Cut out around Moses' hands and chin (but leave his shoulders connected) so that they fit over the basket and look like he is holding on. 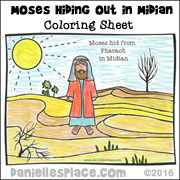 Children color the paper doll Miriam and hang baby Moses in a basket on her arm. 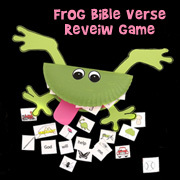 Use the paper doll to act out the Bible story. 1. 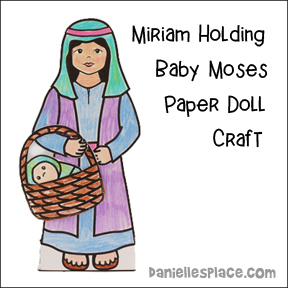 Before class print out the Miriam paper doll pattern and Baby Moses in a basket pattern onto card stock. 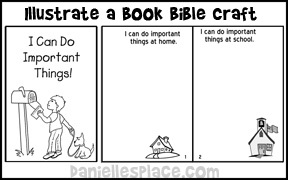 Available to members on the Bible lesson "You Can do Important Things" or as an instant download. 2. Cut out the patterns. Cut around Miriam's hand and arm and cut out the inside of the handle of the basket so it can be hung on Miriam's arm. 3. In class have your children color the Miriam and Baby Moses in the basket pieces. When they are done bend the tab at the bottom of the Miriam paper doll into a circle towards the back of the paper doll and glue or tape the tabs together to make a stand. 4. As they color ask your children how they help at home and school. 5. When they are finished encourage your children to act out the story using their paper dolls. 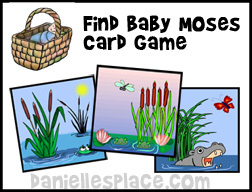 The teacher places a picture of Baby Moses behind one of the cards. Children take turns picking up a card to see if they can find Baby Moses. Children draw pictures of important things they can do at home, at school, in their neighborhood, and at church. When your children are finished have them share their picture with the class and see if the children can guess what the pictures represent. 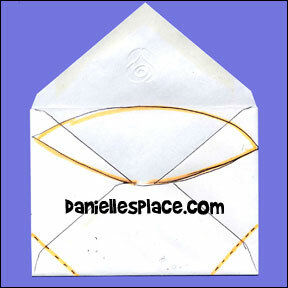 (Younger or Older Children) Before class print out the basket patterns (Available of The Resource Room) onto card stock. Cut them out and glue the patterns back to back. In class turn over all the baskets so that the side with the blankets are showing. 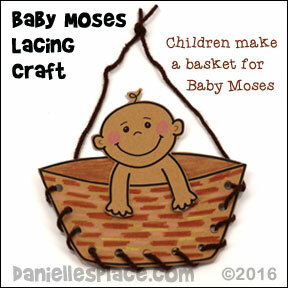 Let your children take turns guessing which basket Baby Moses is in. Play like the old shell game, mixing up the baskets while the children try to follow the one that Moses is in. If a child guesses correctly, the next child takes a turn. 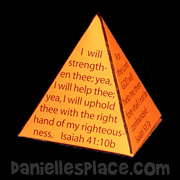 If a child is wrong, he or she has to say the memory verse and then try again until he or she finds the right basket. (Younger Children) Tell the children that you are going to play a game. One of them will be Moses' mother and she will hide Baby Moses. The other children will pretend to be the princess (if you would like you could have them wear crowns or make crowns to use in this game. You may be able to get crowns from Burger King). Send all the children out of the room except "Baby Moses' mother". Help the child hide the baby. 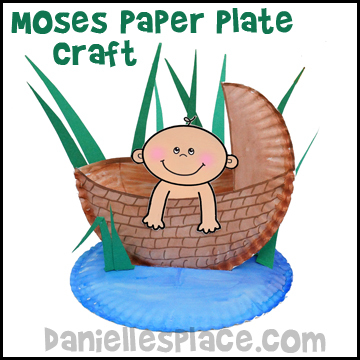 If you have a very small room and not many hiding places for a real baby doll, you can use the craft picture of Baby Moses and tape the baby under chairs and table and on the walls. When the baby is hidden, call the "princesses in to find Baby Moses". Whoever finds the baby gets to hide him. Play until every child gets a turn. If you think this activity will get too noisy, you can have a Baby Moses hidden before class and when activity time comes tell them to find the baby. Have the children wear the crowns they made and look for baby Moses which is hidden somewhere in the room. Bring in a bunch of small toys and objects, some that float and some that don't. Pass out one toy or object per child, (Make sure when you pass them out that they know they can't keep them, if that is the case, or just pick objects that the children won't be interested in like pencils, nuts and bolts, etc.) Remind them that Moses' mother put tar all over the basket to make it float in the water before you start the game. Call one child at a time and ask him if he thinks his object will float on top of the water like Baby Moses' basket or sink. Then let him or her drop it into a bucket of water to see if he or she was correct. I made some blue Jell-O and put it in individual clear plastic cups. (This represents the river.) Next, I let the children squirt a mound of canned whipping cream on top. They pushed it down in the center with the bowl of a spoon. (This made the basket.) Next, they put a green grape in the indentation (This was the body of the baby.) A banana slice made up the face of the baby. Finally, we added thin pretzel sticks around 1/2 of the edge of the Jell-O (These were the bulrushes.) The kids really loved it and talked about it for months. All the moms had to go out and get blue Jell-O and all the fixings so they could do it again at home. 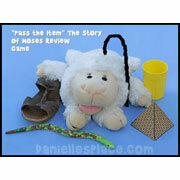 I work with 3-4 year old children and they love the Baby Moses story. 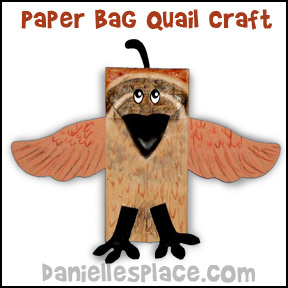 For a craft we take brown paper lunch bags and cut them off about two-inches from the bottom so they look like little baskets. Next I take some of my young son's old socks (cleaned and bleached! 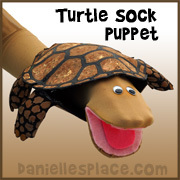 ), stuff the toe area with cotton balls, give it a twist and then pull the ribbed area over the twist. 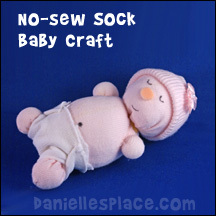 *Directions on how to make sock babies can be found on the Sock Doll Crafts for Kids Page. When making them for young children, you can make them without the arms and legs and just have the children wrap a cloth around the baby. Families are for having fun! Families are for helping us grow. Families are for are for helping. Families are for making good memories! Families are for being together! The pages for this book are available to members only and go with the Sunday School lesson "God Gives Us Families". This activity sheet comes with a background pattern and pictures of families. Children pick pictures that remind them of their families and glue them to the background sheet. They can also draw pictures of their own families and add them to the sheet. 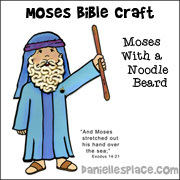 Go to the Moses Parts the Red Sea Bible Crafts Page for more crafts and activity ideas. 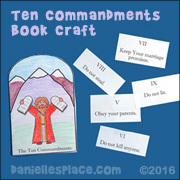 Ten Commandment Tablets made from foam core board. 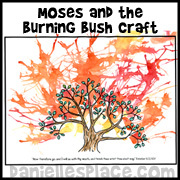 Moses sends Joshua and Kaleb and the other spies to check out Canaan - Sometimes we feel like grasshoppers in a world of giants like the spies sent to check out Canaan in this story. When we feel this way we should remember everything that God has done for us. He will give us the strength to deal with our fears and problems. This lesson is available for preschool and older children. This is part of the ABC, I Believe Series of Lessons that includes writing, cursive and print, and other activities. 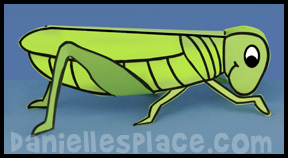 Crafts include a 3D paper grasshopper or a grasshopper made from an egg carton, or a color and activity sheet. Activities include making grasshopper cookies or a batch of grasshopper guts. Children will also enjoy playing Grasshopper Bopper with balls. Just draw a grasshopper face on the balls and have the children bounce the ball and say a word from the Bible verse each time it bounces. I love your web site. I am teaching 4 & 5 year olds. I have taught Sunday School for years. I never really liked the teaching material but I used it because I wasn't sure where to get really great stuff. 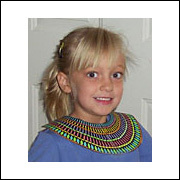 I found your web site when I was looking for a craft for Joseph and his coat of many colors. You have great ideas and have been a real blessing to me. I have taken your ideas and used them in my teaching. I also incorporated flannel graphs and other ideas that I have come up with. I think you have inspired my creativity and brought me a new desire to teach. Thank you for your ministry. Sincerely, Lynn S.
Biblequest Moses Action Figure - Children will love acting out the Bible stories of Moses with this action figure. Using toys to teach help children remember longer and relate easier to the story. Use action figures as props in your Sunday School lessons and have your students reenact the story to reinforce your lessons. BibleQuest - Noah Action Figure - This action figure comes with tigers, turtles, snakes, and a collectable story card. "Children will discover that no matter how new or fearful their circumstances, God is always with them."